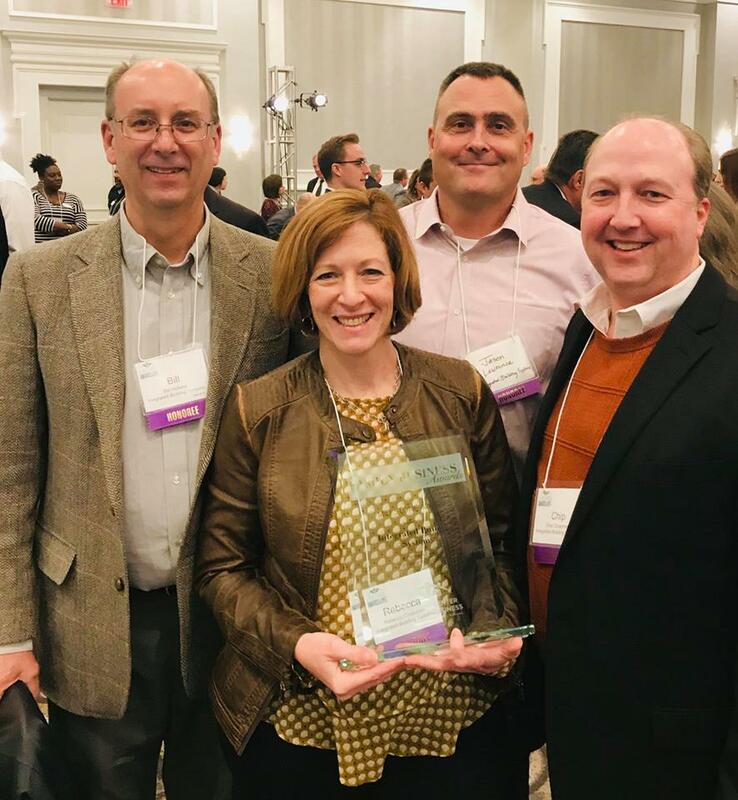 Integrated Building Systems was honored Wednesday, November 14, at the Conway Center for Family Business’ 20th Annual Family Business Awards program by receiving a Milestone Achievement award for reaching its 25th anniversary of business. The Milestone Achievement recognizes family businesses that have reached a significant milestone during the award year (longevity, business or other significant achievement). Receiving the award were Bill Helland, Vice President; Rebecca Chapman, Marketing Manager; Jason Lawrence, Operations Manager; and Chip Chapman, President (see photo, right). “Family businesses are the backbone of the American economy and are vital to the Central Ohio economy and community,” said Jill Hofmans, managing director of the Conway Center for Family Business. “Integrated Building Systems, through its performance and in the marketplace, deserves this recognition of longevity. The Small Business Association estimates that 30% of new businesses fail within their first two years, 50% within the first five years and 66% within the first 10. Only 25% make it to 15 years or more. The Conway Center for Family Business is Central Ohio’s resource for educational programs, resources, and networking opportunities to support the growth and success of family-owned businesses. The Center celebrates the successes of family-owned businesses at its annual awards program and offers peer group opportunities for next-generation leaders, family business leaders, women family business owners, and more. The organization includes approximately 200 family-owned businesses from Central Ohio that employ more than 20,000 individuals. The Conway Center is celebrating its 20th Anniversary in 2018.